Photos by Jerry Pefferly © Jerry Pefferly, 2010; all rights reserved. TOM HAL F-20 (GIBSON'S TOM HAL), a blue roan Tennessee Walking Horse, was born in 1862. As a stallion, he had a notable impact on the Tennessee Walking Horse and the American Saddlebred, getting the famous Little Brown Jug, Little Brown Hal, and so many impressive others. 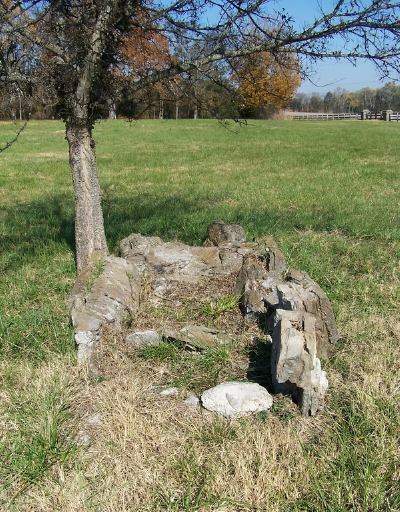 He had several owners, but his last was Frank G. Bufords, who buried Tom Hal F-20 after his death on July 5, 1890, on his Rockdale Farm. 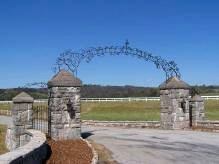 Rockdale was later purchased, along with other property, to form candy magnate Frank Mars' MILKY WAY FARMS. 1940 Kentucky Derby winner Gallahadion and Ethel Mars' race filly Forever Yours were among the horses bred, foaled, trained and raced from MILKY WAY FARMS. Tom Hal F-20's grave is an easy walk into a level field just off Route 31, bordering MILKY WAY FARMS. --J.P.
©2003 - 2010 Thoroughbred Heritage. All rights reserved.